Gurney Halleck is a fictional character in the Dune universe created by Frank Herbert. He is a major character in Herbert's Dune (1965) and Children of Dune (1976), and appears in some of the prequel and sequel novels by Brian Herbert and Kevin J. Anderson. 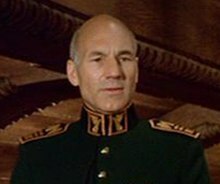 Gurney is portrayed by Patrick Stewart in the 1984 David Lynch film Dune. P. H. Moriarty played the role in the 2000 Sci-Fi Channel TV miniseries Frank Herbert's Dune and its 2003 sequel, Frank Herbert's Children of Dune. The character will be played by Josh Brolin in the upcoming Denis Villeneuve film Dune. Halleck is a talented minstrel skilled in the use of the baliset. His jawline bears a scar from an inkvine whip wound inflicted by Glossu Rabban in the Harkonnen slave pits. A loyal friend to Duke Leto Atreides and his concubine Lady Jessica, many years after Leto's death it is suggested in Children of Dune that Gurney and Jessica have become lovers. Paul Atreides refers to him as "Gurney the valorous" in Dune, and Duke Leto comments that Paul has named Gurney well. Halleck is Paul Atreides' weapons teacher, as well as a skilled musician. He is a chief officer of Duke Leto Atreides, and serves alongside Duncan Idaho as a Swordmaster of the Atreides Household. According to Dune, Gurney was trained by "the best fighters in the universe", and alongside Idaho and Thufir Hawat gave Duke Leto a war council almost unparalleled in the Imperium. He manages to survive the fall of House Atreides on Arrakis with 73 men. In the years after the attack, he falls in with the melange smugglers, eventually becoming a powerful figure. His smugglers fall for a Fremen trap — a fake hoard of spice — and are almost killed before Paul, now the Fremen leader "Muad'Dib", recognizes him. Halleck later becomes Jessica's loyal chief officer after nearly killing her, mistakenly believing she betrayed Duke Leto. In the later novels it is implied that the two become lovers, although this is never confirmed. In Children of Dune, Gurney returns to Arrakis with Jessica from Caladan. He coordinates a purging of dissidents along with Stilgar, an operation that he kept secret. He goes to the sietch Jacurutu under what he believes are Jessica's orders to test that Leto II has not fallen to Abomination. When the Fremen Namri reveals that the testing was ordered by Alia, he kills the man and escapes, sending a message to Duncan Idaho to set off the course of events that will force Stilgar to act. He goes to Tuek's Sietch, where he takes temporary shelter with a new batch of smugglers before stealing an ornithopter. With it, he escapes to a rebel sietch, where Leto II and The Preacher arrive. Leto II takes him to Shuloch. After Leto II returns to Arrakeen and takes the throne, Gurney is assigned to Sietch Tabr as part of Stilgar's Council. Gurney has more recently been explored in the Prelude to Dune prequels (1999–2001) written by Brian Herbert, Frank Herbert's son, and Kevin J. Anderson. According to the prequels, Gurney Halleck was born on Giedi Prime, the homeworld of House Harkonnen. After an incident with the local militia and the murder of his sister, he escaped Giedi Prime and aligned himself with the rogue House Vernius. Eventually, after a string of conflicts and the death of Earl Dominic Vernius, Gurney Halleck arrived at the Atreides homeworld of Caladan seeking the exiled Prince Rhombur Vernius. After helping reclaim the planet Ix for House Vernius, Halleck served House Atreides, eventually becoming Paul Atreides' weapons teacher. In Chapterhouse: Dune (1985) it is revealed that the Tleilaxu Master Scytale possesses a hidden nullentropy capsule containing cells carefully and secretly collected by the Tleilaxu for millennia, including the cells of Paul Atreides, Duke Leto, Jessica, and Gurney. A ghola of Gurney is "conceived" in Sandworms of Dune (2007), a sequel to the original Frank Herbert series written by Brian Herbert and Kevin J Anderson, but is killed during gestation in an act of sabotage. ^ The Brian Herbert/Kevin J. Anderson prequels give Gurney's sister the name Beth. ^ Gurney's later involvement with Lady Jessica is inferred in Children of Dune as Alia notes, "Gurney Halleck would be with [Jessica] ... Some said he'd become her mother's lover." ^ Maslin, Janet (December 14, 1984). "Movie Review: Dune (1984)". The New York Times. Retrieved February 13, 2019.